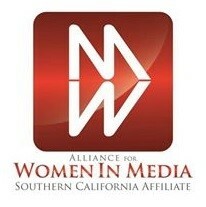 Los Angeles — March 7, 2016 – Alliance for Women in Media Southern California Affiliate (AWM SoCal), a nonprofit organization helping to empower and fuel professional development of women across the media landscape, today announced the names of six women who will be honored at the 57th Genii Awards. More women will be honored at the gala event, which will be held on Thursday, May 5th as part of Digital Hollywood at the Skirball Cultural Center in Los Angeles. The Awards (pronounced “Jeannie” and named in honor of Jeanne Gray McDonald, the Affiliate group founder) acknowledges the notable achievements of women in media and entertainment. Honorees are selected based on their pioneering efforts, dedicated leadership, commitment to quality and excellence, and their community contributions. 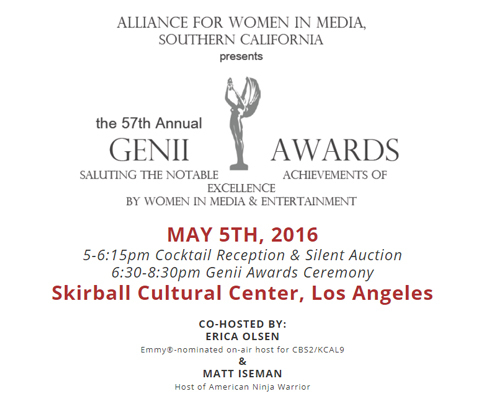 Genii honorees have made significant contributions to advance the impact of women in media by educating and acting as a resource to its members, the industry and our community. Lucille Ball, Carol Burnett, Betty White, Dr. Laura Schlessinger, Whoopie Goldberg, Ellen DeGeneres, among others.